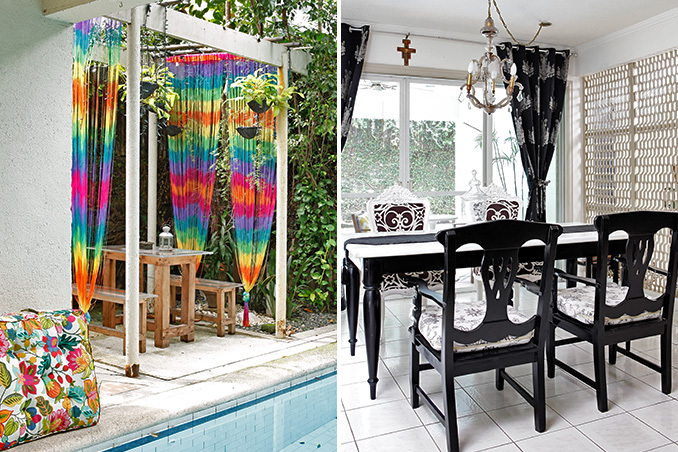 A typhoon’s aftermath usually leaves a mass of chaos and destruction, but 2009’s Ondoy gave Vicky Marchadesch a fresh beginning in a new home that would showcase her unique style and yet undiscovered flair for home decorating. Finding a new – albeit, smaller – home in the same village was a stroke of luck, yet Vicky had no definite plans on how she wanted her new home to look. Inspired by Real Living and Domino magazine, and complemented by her affinity for Jonathan Adler’s aesthetic which fuses bright, bold colors with clean lines, patterns, and textures against a basic palette, Vicky put together her new abode and showed off her own personal interior decorating style. A notable feature of her home is its eclectic mix of décor which ranges from refurbished and vintage items from her old house to easy DIY projects that serve as Vicky’s outlet which was previously satisfied by scrapbooking hobby to travel discoveries and souvenirs that tell stories of her wanderlust. Her home is a perfect example of how your home should reflect who you are. Read the original article (“Up Close and Personal”) in the October 2011 issue of Real Living Magazine. To download a digital copy of Real Living Magazine, visit Summit Newsstand at https://summitnewsstand.com.ph/real-living.